In 2004, Ewan McGregor and Charley Boorman and cameraman Claudio von Planta went on a motorbike ride on a couple of BMW R1150GS Adventure's that covered 20,000 miles; from London to New York - the long way round as they say. They went east through Europe and Asia, flew into Alaska and yes - they even came to Canada! They called that journey "Long Way Round". A support team came along as well but generally followed behind to help if it was needed. The journey was documented via some small camera's they brought along with them and Claudio bought along some more advanced gear. A book was written, a TV series was produced and you can now buy an extended edition DVD. I must say that I really enjoyed the series and bought the book as well. Well the boys have been at it again and this time they dubbed the journey "Long Way Down". If you were a fan of the Long Way Round I suspect you'll be interested in Long Way Down. If you haven't seen or heard of Long Way Round then I would encourage you to check it out. In Long Way Down, Ewan and Charley travel from John o'Groats in northern Scotland to Cape Town, South Africa. As in Long Way Round, visiting and attempting to increase awareness for UNICEF projects was an integral part of the journey. Charley even had a gig in between filming Long Way Round and Long Way Down called Race To Dakar. In 2006 he entered the Lisbon-Dakar Rally, which is actually an off-road endurance race considered by some to be the toughest race in the world. It does have a really different feel but will appeal to those interested in off-road riding and the world of off-road endurance racing. For Long Way Down they started on May 12th, 2007 and finished on August 4th, 2007. That's 85 days and roughly 15,000 miles! They took Claudio along for the trip again this time and went on some shiny new BMW R1200GS Adventure's that were what you can buy at your local BMW shop plus some extra's add-on's (or farkle's as they are commonly referred to) to make the journey just a little bit more comfortable. No disputing about whether to go with a KTM this time around, it was all BMW! There is a television series that has been produced from the epic adventure but I don't know when we'll see it in Canada. Hopefully OLN will pick it up like they did Long Way Round. Six episodes have just finished airing on BBC 2 from Oct 28th - December 2, 2007. - Pillion (passenger) seat has been replaced with a luggage rack for tents, sleeping bags, bedrolls, etc. - Michelin tires - road tires for Europe and knobbies for Africa. - Touratech rear hub cap cover. - Anodized Aluminum Brake Fluid Reservoir cover. - Stainless steel heel guard (protects rear master cylinder from boots). - Ohlins suspension - front and rear. - Touratach Tank bag for maps, camera's, etc. - Touratech side bags - smaller tools and puncture repair kits were kept here. - Aerial for onboard communications system (seems to be mounted to the pannier on left side of bike). So with that - keep an eye out for news on the TV Documentary series! I haven't found any news on when or if it will air in Canada but I'd bet that OLN will air it eventually. I think this book will be on my wish list for the holidays! It's available at several online retailers. The DVD doesn't appear to be available yet though. A Couple of Hot Italian Twins! As I looked out my window this Saturday afternoon looking at the snow I thought what better time to go to the motorbike shop to see if they had anything new in. Seems like a strange time to be thinking of motorcycles or going to the motorcycle shop you might say but I'm oh so glad I did because they had recently gotten in a couple of hot Italian twins! Both of them were shiny new 2008 models - red of course. A 1098s, yes an S! and a Hypermotard S as well! The 1098 S had a sticker of $24,995 and for that you get fully adjustable 43mm Öhlins FG511 forks, which sport low friction Titanium Nitride fork sliders, fully adjustable Öhlins 46PRC rear shock "with a ride enhancing top-out spring." The wheels on the 1098 S are lighter Marchesini forged and machined wheels, reducing weight by 1.9Kg (4lbs) and a carbon fiber front fender. The 1098 S also has the Ducati Data Analyzer system as standard equipment which "enables the retrieval of data and analysis of data collected from your previous track session or road trip." The DDA package includes software for your personal computer on CD, a data retrieval USB key and instructions. According to Ducati's website the difference in weight between the 1098 and the 1098 S is 377 lbs vs 381 lbs. Note - These weights from Ducati's website excludes battery, lubricants and, where applicable, cooling liquid. That four pounds will cost you an extra $5,000. Note the gold colored suspension - a giveaway that this is the S model with the upgraded Öhlins suspension. It might seem like a lot for just four pounds and some other goodies but remember that the weight savings is in the wheels so it is rotating and unsprung weight. I'm no engineer but everything I've read and my basic understanding of it is that this is where you want to reduce weight to have the most impact. One pound of rotating upsprung weight is like removing two pounds from the chassis. If you want something really, really exclusive you might want to take a look at the 1098 R. The 2008 1098 R has an MSRP of $44,995 CDN. The 1098 R has 180 hp and the 1098 S and 1098 has 160 hp. Some pretty impressive numbers! "The new 1098 R is the most powerful and lightest twin-cylinder bike ever produced by the Borgo Panigale factory, with the highest torque/weight ratio in the sportbike category.It is the jewel in the crown of the successful Superbike family and it represents the ultimate expression of racing technology applied to a production bike. Ducati Corse engineers and riders worked in close contact with the R&D division during the development of this project to produce a true racing bike, a masterpiece of incredible performance and innovation.The numbers speak for themselves. A total of 180hp is on tap for this new hypersport machine, together with an amazing 99.1lb-ft of torque. The weight figure also confirms the racing origins of the 1098 R: 363lbs puts the bike at the forefront of this category"
The Hypermotard has a 1078 cc L-Twin cylinder, 2 valve per cylinder Desmodromic, air cooled engine that produces 90hp @ 7750 rpm. The S version weighs 390 lbs whereas the regular version weighs 395 lbs (excludes battery, lubricants and, where applicable, cooling liquid). If that doesn't sound overly impressive you need to see this bike up close! This bike has some very innovative styling that when it first was shown as a concept really got people excited. It was unveiled at the Milan International Motorcycle Show in November 2005 and hours later it won "best in show". When it arrived in showrooms it lost none of the excitement it showed in Milan. This is one impressive looking and performing bike! One of the really trick features that you'll quickly notice are the fold away mirrors. The signal indicators are built in to the hand protectors and you can fold the mirrors out for the street or fold them in for the track. The S model has upgraded brakes (Brembo Monobloc calipers), upgraded suspension, forged light alloy wheels, and a fully adjustable Ohlins rear monoshock. There's some information in the Accessories section of Ducati's site for this bike that you can buy a racing exhaust that not only boosts performance but is a whopping 7 kg less than the stock. This might be "the" must have accessory! It has aggressive Motard styling that combines the looks of a dirt bike with a street bike. It's super narrow and has a very upright seating position. 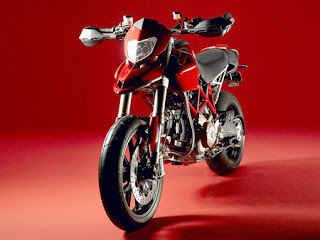 Here's a link to the full scoop on Ducati Canada's website where you'll find more technical spec's and pictures. They've got some nice wallpapers in there. I must admit that I love this bike! When it first came out in 2005 it was immediately on my desktop where I'd see it every day. It doesn't disappoint in person either these two years later. I've only seen one of them on the street driving around in Winnipeg but I'm told by the dealer here that they sold two in 2007. One stayed in Winnipeg. I don't think this S model 2008 will be around for long. I know if I win the lottery it would be the first new bike in my garage!